Directors hate them. Fundraisers swear by them. And board members often get called on to make them. Done badly, they kill the natural excitement that fills a theatre immediately before live performance. Done well, they help the audience connect beyond the immediate performance. The curtain speech is very much like the “elevator speech” exercise in business: you have 90 seconds to engage your listener and entice them to become involved in your project. What will you say? We hit the bottom of a flume and leapt into the air. 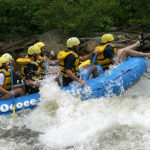 The raft went left and a woman at the front went right— into the Class III rapids. She surfaced, legs out in front, and let the life vest carry her along, pushing off rocks with her paddle and arms. Our guide shouted instructions and we manuevered the raft close enough to throw her a rope. As we pulled alongside, two of our crew grasped her life vest and pull her aboard. Cold and little shaken, she took up her paddle and dug in. She was safe again, partly because she had known what to do and so had we. But the reason we knew what to do was that our whitewater guide knew about risk management.